“Once you have the basic dry goods laid in, how should you approach the rest: meats, vegetables, vitamins, i.e. the things that help round out the diet.” ? That’s an excellent question and one that should inspire some good comments! For long term preparedness there is often focus on dry goods and foods that are specifically processed for long shelf life (rice & beans, freeze dried, #10 cans of ‘xyz’, etc..). That’s all good! (and important). But what about rounding one’s food storage (for the long term) but with other items that will complement the diet? Who wants to eat just rice and beans when you’re in SHTF mode and digging into your long term inventory? Do it yourself Home Canning is popular among the preparedness minded! The sky’s the limit as to what you might can at home yourself. Any other complements? I have a variety of articles here on MSB that touch on this. However lets approach it anew. What are some of the additional complementary items to include in one’s overall “long term” food storage inventory? One thing that immediately comes to mind is VITAMINS. If I only were able to have a few complements for my food, they would include salt & pepper. They will enhance just about any bland food that you might have! We buy our pepper as peppercorns. We use a pepper grinder (actually a salt & pepper grinder set). That way the freshness is maintained right up until you grind it. Much better that way. Choosing herbs and spices to keep long term is a matter of preference and taste. Most of you surely have a spice rack or spice drawer with a number of typical size grocery store spice jars of your choice. However I suggest that you consider getting some BULK of your favorites. We purchase bulk (sealed bags or larger sealed containers) of the spices that we regularly consume. You get a much better price that way too, and you’ll have plenty on the shelf. What others would you bulk up on? If you raise cows and chickens, you’re probably all set. For those that don’t, you might consider adding some dairy for rounding out your long term food storage. Do you have any preferences for long term dairy? 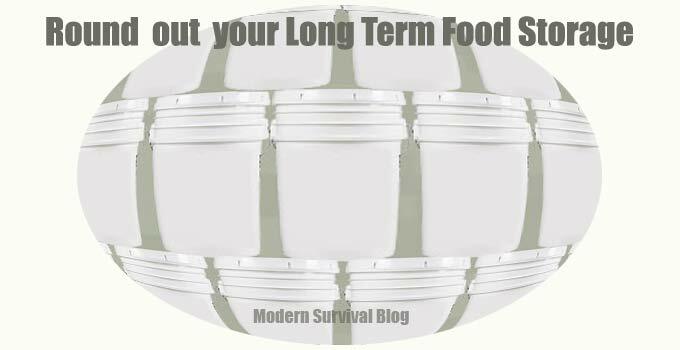 Other Areas To Round Out Long Term Food Storage? The thoughts above are meant to get the wheels turning. What other areas having to do with rounding out your long term food storage once you’ve already set back your dry goods and other such common items? Consider, if budget allows, some canned meat from Lehman’s. Very good quality without additives. They have Pork, Turkey, Chicen, and Beef. I agree. Their products are excellent. We store 25 lbs of sprouting seeds, never know what time of year things are going to go to boom! they even grow in the dark. Do you sprout often? I sort of worry about bacteria that likes warm and dark. Certainly a good source of fresh food! We’ve stocked bulk chicken/beef base, cheddar cheese powder, buttermilk powder, and several spices like chili powder and cayenne pepper. We buy them online, as the price per ounce in grocery stores is outrageous. We also buy butter powder and peanut powder by the case. A little tip: If your salt goes from granular to brick, use an ‘old’ wood rasp to make it granular again. I say ‘old’ wood rasp as no matter how well you rinse it it will rust. Every time I think we have it all, up pop’s some new something we didn’t think about. This is good as it keeps us engaged and thinking. My kids think Dad and his wife are crazy but we don’t care, we just keep stacking. I’d also add cinnamon sticks, nutmeg seeds and coriander seeds to the list. I was told years ago grinding coriander to powder makes it cumin by my grandmother so I have been doing it and adding it to the taco meat and my chili for years. I have a variety of the Keystone meats,I really like that it’s just the meat with a little sea salt. No additives and they have two sizes of cans. so you don’t have to store only the big cans. According to their web site I was on last year , they stand by the product IF kept in proper conditions for 5 years. I just recently got a Costco membership and am looking to add more tuna, salmon, etc, to the deep pantry . What is the opinion on the Kirkland brand, I may have missed any reviews that may have been made. @ Grannyo, Actually there is a cumin seed. I buy the cumin seed in bulk, they look like caraway seeds. I use it in our chili. Thanks Peanut, I will look into adding cumin seeds to my list of herbs/spices to store and grow. DH used the can of the Costco chicken, we got when I signed up tonight in a salad. He liked it, said it was flavorful and did well in the salad. He rinsed it off as he didn’t want the oil ?on it, chicken was packed in water but he rinsed it off anyway. Strange man I married LOL. A.C. Thank you, We will have to try the roast beef, currently I have the Keystone beef, will do price comparison on the Costco VS Keystone with delivery charges on the Keystone added in. Costco may be less expensive for us. poorman, DH just got me a pressure canner this fall and I can’t wait to start using it. Right now I am down south taking care of DIL1 and grand baby due to DIL’s back surgery. Son 1 just started a new job and can’t take time off to do for her. So I’ll have to wait till this summer, DIL 2 (son2’s wife) is going to learn with me how to pressure can. We both do water bath canning but want to learn how to pressure can for the rest of the veggies and fruit we want.T hanks again for the advice. We purchase the roast beef/chicken/tuna from Costco, their brand. They were carrying an organic chicken but have not seen it lately, all of it is good for a back up when you need cooked meat for a meal. The only draw back on the roast beef is the amount in the can. Do not get me wrong the can is full of meat but the price per unit is more than some will want to pay. If you know how to pressure can your own beef roast it would be more cost effective. Since I need a back up for dh special meals this is convenient for us. I use Kirkland brand canned chicken all the time. I do home can my own chicken and turkey also. I like to make chicken and dumplings with the Kirkland as it is much quicker than boiling down fresh chicken. Also works well for chicken taco’s. Ken; Careful with the vitamins, my doctor told me a while back to stay away from One A Day, and Centrum for men/women; He said that by the time they get to the consumer all of the vitamins have leached out so they will not do you any good. He said to get a good “quality vitamin” but, he could not give me any names/brand names at the time. Juice Plus is great. It is just concentrated fruit and vegetables, organically grown. It is expensive, but then I haven’t had a cold or flu for fifteen years when I started taking them. For me, it is worth the expense. I really like this article, Great food for thought, good job Young Man. Why one would ask? Stock rotation (keep refreshing the Deep Pantry) and ‘diet shock’, meaning if you 100% change your diet if/when TSHTF you’re going to be basically worthless for a week or two, and use a LOT of TP, simple as that. Vegetables, why store FD-Spinach if you HATE Spinach? And let’s face it, if you’re a Vegetarian your probably not going to store and eat a lot of canned Ham and Beef. As a side note, is Spam actually Meat or?????? So how do you go about…XYZ…… Simple, do an extensive review of your and your families diet and store those things, and I do NOT mean McDonalds and other CRAPO foods like Pizza and 99% of the Fast Fake Food that’s so common now-a-days. I’m in the belief that one should be able to simple switch from the weekly store bought to their Deep Pantry foods, without any real noticeable changes all awhile using and constantly rotating out the Pantry Foods. And yes there are ways to “long Term store about everything under the Sun. I also know there are seasonal changes in most people’s diet, such as when the Garden is in full swing, but again, incorporate those foods into the Pantry. Canning is not a lost art. Review your current uses and what sits on the shelf for months, and adjust your “Long Term Storage” accordingly. Soaking Spam in pineapple juice is supposed to help. I hear there are a few pineapples grown in your area. Growing up dad made breakfast from spam, eggs and hot sauce and learned to love it. Of course that was in a time when you ate what was put in front of you or you went hungry enough. I have been trying to learn as much as I can about prepping, and one thing that has helped is substitutions. Any cream based soup would work for your favorite stroganoff recipe. Of course, you can also use canned milk made into buttermilk with vinegar, then thickened just a bit with tapioca. I own “Great Depression” cookbooks, and they used gravy a lot when they needed a cream base. Lots of creative, inexpensive solutions – ! I’ve been testing recipes now, given my dietary restrictions. Hope that helps. @Happy Prepper I also have several of those Depression-era cookbooks. I’ve also got a few from the 40s-50s when frugality was still necessary and women still cooked from scratch. They all have a bit of nostalgia attached to them and are really fun to work up a recipe with. Personally, I’ve been eliminating most commercially canned foods because of the shortened shelf life and my concerns for those newfangled ring-tops. At some point, those commercial creamed soups will be consumed and there may be no more. So I’ve just stopped buying any for intermediate storage, I don’t use them anyway. I make my own creamy sauce and substitute it. The creamed ‘soup’ sauce is made with a roux (butter and flour with milk). As long as I have butter, I can make a basic roux sauce. Likewise with canned milk — those cans of evap. milk don’t have a long shelf life. I use dehydrated powdered milk from several vendors and they have a much longer shelf life. That’s how I can extend having shelf-ready milk products. At our home we don’t eat canned foods (store bought). We can our own food, eat fresh vegs fresh meat and cheese make our own bread. We store alot of canned foods Can’t find anyway around it. i’ll hate the day we have to start eating canned and dryed foods. But i believe tshtf is comming so you do what you have. God the though of canned Spinach. You are right to mention check and see what sits on shelves for months and adjust accordingly. I have seen changes in what we eat over the last eight years and it does require a change in storage. That being said, storing what I eat and eating what I store allows for an easy change should the grid go down suddenly. The only real change would be adjusting to the cooking setup, but that is what camping trips are for. Bulk items I’ve added are the powdered or dry mixes for brown gravy, poultry gravy, and gravy or sauces when using a crock pot. I get a lot of these mixes, spices, and bullion at Sam’s or Costco after trying them in the smaller single serving envelopes like McCormick has. A multivitamin and vitamin C, in a double dose. I realize this is about food storage, but I would like to add that without a supply/source of clean water cooking will be difficult, and we need water to live. As an answer to why store some veggies ( you used spinach as an example ) that you don’t like I would think that would go back to the vitamin thing. I love spinach but only fresh. I really can’t stomach cooked spinach but I do store it freeze dried as I can add it to soups,stews,rice, beans ect and get the iron and other nutrients in it but won’t get the flavor. All of the freeze dried veggies I store are to use as flavoring and sight appeal if added to other things. I have tried straight up eating them by themselves but was not impressed as I really don’t go for the caned veggies either. When added to a soup or stew they become palatal. JMHO of course. I grow fresh spinach, Swiss Chard and Beets, for the greens in my garden, Harvest the greens fresh, and dehydrate them together. Make them into flakes and add these to soups, stews, pasta sauces, ground meats for meat loaf, burgers, meatballs, etc. I would literally physically starve myself if I had to eat canned spinach! After the basics are taken care of as well as the complementary items suggested, remember that there are some items that are hardly grown in the US at all and would be almost completely unavailable in a catastrophe. These include bananas, coconut, coffee, chocolate, tea, cinnamon, black pepper, pineapple, vanilla, cashews, mango. Also, there are some items that are grown regionally and would not be available everywhere. These include rice, sugar, citrus, cranberries, blueberries, maple syrup, tobacco, salmon and shrimp. And if you don’t live near the ocean, salt may be scarce. Concur on all but the salt. Lots of salt flats and salt mines inland. I’ve said it before and I will say it again. Sea Salt is advertising hype. All salt comes from the sea including salt flats and salt mines. The only difference is when the after evaporated out of it. Within the past year as in sea salt, or in the past billion years as in salt mine. If you think about it salt from mines is probably purest there were no industrial pollutants falling into it. Salt flats are probably the next purest as the the pollutants in it are only recently falling on the top of it. Nice to see that the Himalayan salt that Ken’s link mentions is not hyping itself as sea salt. There are no seas in the Himalayas. It is a mined salt. It is not an iodized salt. Goiter is a thyroid condition frequently caused by lack of iodine and is more problematic in countries where iodine is not added to table salt. The comment by Ozarks Tom about using an old wood rasp to get the salt is a good one and salt certainly contributes to rusting. Probably not a concern as iron in some amounts is good for you. The mineral in pink salt that changes it’s color is incidentally, iron. I guess for the cost of Himalayan Salt being two to three times as much as regular table salt that price is not a serious consideration. Most people are not going to consume enough of it to make it a major hit on the wallet. Please consider using iodized salt along with it. Do a Wikiedia search on salt. It has a fascinating history. While you are there, do a search for Goiter. You will add iodized salt to your preps. I guarantee it! I mix iodized in with the other good salts. Yes all comes from the sea at some point in time. However there are different micro minerals depending on the area where the sea receded. My new fave is the Dead Sea Salt. Very low in sodium, high in flavor. Hopefully it is not too contaminated. Interesting salt was prized higher than gold. Could very well happen again! We keep Sweet Baby Rays BBQ sauce and A1. Any kind of road kill taste better with the right sauce. We also keep chili powder, garlic, pepper corn, and other assorted spices. We also keep bulk salt for curing meat. We can not afford the specialty long term stuff but we do keep what we eat. As a matter of fact I canned 14 pints of soup and broth last night. I have it, really good info. Agreed with the “after food” cleanup stuff like Soaps and the likes. What I have been doing lately is dating the Dish Soap bottle and Launder stuff so I know when I opened it and about how long it last. Hey Nailbanger, if you’re gonna start sticking boars and putting them on the spit, don’t forget a bag or two of sausage seasonings. Amazon has a couple of good brands they offer for $8 or so (generally, those seasoning bags will do 25 lbs/bag). Had no idea you were overrun with deer! Wow! Ain’t nothin’ shabby about venison! I think venison stew is my favorite stew. And jerky? Who could walk away from well made jerky?!! Good call Nailbanger. I was wondering when someone would mention items basic to food preservation. When all that carefully packaged food is gone you’re going to have to replace it and almost all of your foraging will have seasonal limits: when it’s ripe, when it moves into the area, when it can be taken without seriously depleting the herd-flock-covey-etc. The ultimate SHTF will mean almost all of the technologies we depend on now for keeping food safe and assuring its long term availability will be gone. We’ll need to know the pre-industrial methods and have the basic supplies to make them work. That’s why #1 and #2 Prague powder are on the shelf in my pantry and there’s a good supply of canning & pickling salt in my cabinets. Once we acquired a decent amount of basics in bulk sizes (and even smaller sizes), we stocked up on canned foods from the store. I also began canning more garden veggies, and then began pressure-canning meats, both home-raised and store-bought. Around the time we began canning more, we began stocking some of the FD/DH #10 cans. We had bought a number of 50# bags of organic wheat berries, but I felt it was important to buy more in the #10 cans. So we began buying those, plus we bought an assortment of beans in #10 cans, too (and also bought a variety of beans in 50# bags). When I calculated that we had 6 months for 5 people, I began buying FD/DH fruits and veggies in #10 cans. The majority of these foods are spinach, broccoli, banana slices, apple, strawberry, and blueberry. The foods that we have a bountiful harvest with, we don’t buy in FD/DH at all (ie tomato, green beans, kale, potatoes, peas, carrots). Then there are the foods that don’t store at all and we’ll only have them seasonally if the SHTF (ie lettuces, mustard/mizuna). Our meats are all home-canned, frozen, or alive and waiting to be butchered. We have some home-canned meats ready to open and eat, and we also have some commercially canned Kirkland brand chicken. We’ve also got cans of tuna that date to pre-Fukishima (once they’re gone, not sure we’ll buy tuna any longer unless we know the origin). We’ve also got some Yoders bacon, DAK hams, and I have Spam on the ‘buy it’ list (we fixed Spam sandwiches not long ago and it was tolerable). We do not have any DH or FD meats at all (or the soy-based fake-meats). We can sustain ourselves w/ small livestock, provided there is adequate feed and protection of the livestock (I think of thieves and rustlers during SHTF times). We also store Freeze-dried breakfast sausage crumbles. We also store some freeze-dried scrambled eggs. Also Yodars canned bacon. Our breakfast protein. Good article… eat what you can and can what you eat. Why wait until SHTF to switch? We actually switched from store bought to our home pantry as a way of life years ago. It took several years but switch we did. You can home can almost anything that can be commercially canned. Saying “almost” I’m speaking from the view of someone who doesn’t want to consume all the chemicals/toxins/contamination in commercially canned and produced foods since many things cannot be canned and keep their flavor and texture without adding chemicals like emulsifiers, stabilizers, artificial colorings, artificial flavorings etc… How do we avoid this? We can the primary constituents and make the final item when we are ready to eat it. Chicken noodle soup is an example since starch doesn’t can very well for long term storage. Can the chicken for long term and then make the soup when you are ready to eat Chicken Noodle soup using fresh made noodles or long term stored dry noodles. You can also can beans and bean combinations for quick and easy meals and snack foods. Stuff like Red beans, white beans, pork and beans, pinto beans for refried beans etc.. I do not consider “Freezing” long term food storage especially for vegetables. If you lose power or your freezer dies, all of your frozen vegetables and casseroles will be lost. Meat will get freezer burn after a couple years. Canned meat on the other hand has a much longer shelf-life. Buy meat in bulk and freeze it until you are able to can it. Freeze the meat for a year or two then either eat it or make it into something that can be canned which will extend the shelf-life out to…?? Oh… I don’t know, I have some rib-eye beef chunks that were canned 8 years ago and they are still quite tasty. You can do the same with other stuff too. DW made a sweet potato pie yesterday from sweet potatoes that we canned in 2011. Obviously, we can’t have steaks and roasts from canned meat so we freeze a lot of meat for that purpose but… if you want to build your pantry with canned meats then home canning is the way to go. We lost a freezer week before last and had to spend all of last week canning all the big stuff to keep from losing it. Here’s a list of many things we have home canned. Some can well some don’t. Snap beans, Butter beans, Purple hull peas, Carrots, Yellow squash, Potatoes, Tomatoes, Sweet corn, mixed vegetables, Sweet potatoes, Beets, Hominy, Mustard greens, Collard greens, Vegetable stew, Vegetable stock, Green peas. Pork chunks, Beef chunks, Chicken, Fish, Pork and Beans, Beef stew, Venison chunks, Spicy pork, chunks, Green chili, Pork stock, Bone soup, Beef stock, Chicken stock, Chicken soup, Mixed, Pork/Chicken/Vegetable stock. Sliced dill pickles, Whole dill pickles, Pear relish, Pickled Beets, Pickled Okra, Pickled carrots, Sauerkraut (canned and fresh), Bread and butter pickles, Pickled jalapeno peppers sliced, Whole Pickled Tabasco peppers, Habanero peppers, Thai chili – all used to make sauces, Hot sauce (home made Tabasco sauce), home made BBQ and A-1 style sauces. Peaches, Pears, Pineapple chunks, Orange / Grapefruit slices mixed, Orange Juice, Satsuma Juice, Grapefruit Juice, Tomato Juice, V-8 style juice, Cranberry Juice, Tomato sauce. This list does not include all the fresh vegetables and herbs we grow, or our fresh eggs, or the multitude of things we make from all the grains and other dry goods we have for long term storage, or all the TP and coffee. This also does not include a list of all the chemicals / additives / contamination and toxic things we don’t consume because we eat fresh and home can. That list is for another article but I will give you an example. Filtered water, Pork bones, chicken bones, whole chicken carcass, beef bones, onions, carrots, celery, garlic, sea salt. (Or combinations of the above). Cooked/strained and pressure canned in glass quarts or pints. Water, Salt, sugar, HFCS, monosodium glutamate, corn syrup solids, corn Maltodextrin, chicken flavor (hydrolyzed corn protein, dehydrated cooked chicken, Autolyzed yeast extract, hydrolyzed soy protein, salt, rendered chicken fat (chicken fat, BHA, BHT, propyl gallate, citric acid), dried beef stock, beef flavor (hydrolyzed corn protein, salt, natural and artificial beef flavor, corn Maltodextrin, Autolyzed yeast extract), caramel color, dextrose, disodium Inosinate, disodium guanylate, artificial flavors, spice. thiamine hydrochloride, butter, butter oil), onion powder, hydrolyzed vegetable protein (hydrolyzed corn, gluten yeast extract, partially hydrogenated soybean oil. You don’t have to grow a big garden or live on a farm to can your own meat, vegetables, pickles, jellies, sauces and pork and beans. Just saying. Wish we were neighbors. I could learn so much from you. Guess i know what ill be doing this weekend! I canned some yellow squash a several times but it has a short shelf life of less than two years. Beyond that it starts to change flavor and consistency. It’s one of those vegetables that is can able but doesn’t really keep that well. It is a delicate vegetable and has a tendency to get soft and fall apart since the canning time 25 minutes at 10 pounds (240 degrees) is longer and hotter than the stovetop cooking time of 20 minutes or less in 212 degree water. That’s one of those vegetables, like eggplants and lettuce that we generally eat on a seasonal basis. I think the Kabocha squash is kind of a winter squash (thick hard outer skin) like the Hubbard and butternut squash. I’ve never canned Hubbard or Butternut squash, not sure how they’d turn out. DW always either cubes them up and cooks them down in a soup or bakes them and makes puree and puts it in the freezer for making pies. If you can some, let me know how it turns out. Winter squash store nicely if they are kept in a cool dry place and they generally store between growing seasons if you have enough of them. Not sure what kind of growing season you have. A few will go bad but many of them should survive nicely. That was something I discovered quite by accident. Goodness Nailbanger where you live can you not simply grow squash year round? Secession planting? Maybe 1 or 2 squash plant a month and never worry about storage? Me in USDA Zone 3-4 (depending what site you accept) I am happy if I get 100+ frost free days to grow. I just dont want to waste these squash! But yea, i was actually going to plant some this week. M&M’s. I pack them into small Mylar bags (cut to size) with an oxygen absorber and store them in a cool place. I am not sure how long they will last. I agree with M&Ms–definitely an enhancement to life! They will stay fine in their original bags for at least a year–I think I’ve done longer, but I’m not sure. I haven’t tried the mylar bag way with them, as I would truly hate having to pitch such wonderful things if they’re bad. I have stored up cocoa powder, as I think it will stay good for longer. I’ll just have to get my chocolate fix other ways than M&Ms. I don’t think anybody here does a better job murderin the english language than me………hahahaha come on back and talk to us. Sometimes we just point and grunt. I heartily agree with you about M & M’s. Can’t live without them. A short while back someone here suggested that you can use kitty litter containers as a sneaky way to store things that you don’t want anyone to find. I decided that M & M’s are the prep I would most hate to have someone find. So I washed and completely dried an empty kitty litter container and have been stuffing packages of M & M’s down the opening. I have seen kitty litter boxes that have a wide lid, but here the only ones in my area are the ones that have screw top lids that are about 2 1/2 inches across. Plenty big enough to insert packages of M & M’s, but not big enough for someone to easily see into in my dark basement and not big enough for the packages to fall out if someone happened to open the lid and turn the container upside down. Golly…M and M’s might fit in a lot of tricky place…..(down a tubular bed post, hollowed out book, etc.. Grin. Skeezix, M&Ms, I use pint canning jars, pour them in, oxygen absorber, use the canning lid and ring, then vacuum seal. So far lasted a year, had to taste test some of jars over the year. Canning jar for the M&M’s, you do not need the oxygen absorber, vacuum seal keep them in a cool dark room and you will find 5 years later they are still good to eat…….including the ones with peanuts. A.C., thanks for the tip, I do the peanut M&Ms also. I had some Hershey’s miniatures to put back. They disappeared somewhere?! Going to have to put out a mouse trap. Dark chocolate/semi chocolate will grey. You can melt the material and it should go back to the color it was before. The only chocolate that does not turn grey is the MILK chocolate. Have some that we put up about 3 years ago, found them when planning on making cookies for the medical offices this year. To go along with all the home freeze dried meats, I have purchased a lot of dry gravy mixes. I have avoided reading the ingredients list, but I don’t think I will really care. Ditto, when SHTF if it taste good and has some nutrition the tummy will appreciate. I try to freeze dry all organic, but don’t make it a big issue. Some yes some no. Walmart has big bags of frozen blueberries that taste great freeze dried. Chicken on sale or whatever. Yes and I will too if need be!!! I have some of about everything that was mentioned. I am definitely going to try the m&m thing. But one thing about freezing meat. If you use vacuum sealer when freezing meat it will last years. We were lucky when we bought 1/2 cow, that the butcher vacuum sealed all the meat. Also we have feed the deer around our area so we should have meat if we really need it! Although I am not sure I could eat Delilah, Lilith, Jezebel, Clara. But I could eat Buck and Larry. Should never have named them. Naming the deer is not the problem. Choosing the right name will do the trick. Can I suggest, “Chops”. “Stew”, “Jerky”, “Chili”, “Pemmican”, “Roast” and “Sausage”. Next year you just add a suffix – “Chops II”, “Stew II”, etc. From personal experience food supplies need to be protected from theft. Although there are various ways of doing this, one way to do this is to store food that is generally considered undesirable, Spam, chicken gizzards, liver… you get the picture. But only if you can eat it. Instead of vitamins, I learned that almonds are nature’s perfect solution. They contain most of the trace nutrients that our body needs. Also, any supplements are not fully metabolized, but since almonds would be ingested as a food, the body processes the nutrients 100%. I stocked up on bags of Great Value Cocoa Almonds, and consume 3 or 4 a day as my “vitamin” supplement. The cocoa is also an excellent solution for all kinds of inflammation, particularly arthritis, rheumatoid arthritis, and “leaky gut” inflammation that most of us suffer from. I’ve had bags stored for months, and they seem nice and fresh. Wal-mart now offers online service, similar to Amazon, with home delivery or store pick-up. Young kudzu leaves, are also very heavy in trace minerals…washed, dried, cut with a scissor and pulveized in food processor, used by the tablespoon to add to soups and stews. Don’t want to add them if you don’t ahve them, but if you have them and are not sprayed with chemicals…. use them.. Some goats like them as well. I just love the products and their prices at the San Francisco Herb Company. Check them out at sfherb.com. If you like Thrive fd products they can be found on the Costco website at a discount a few times a year. I found their fd meats tasty and easy to rehydrate and use, except for the diced pork. The fd green peas, when rehydrated, are almost like fresh. Large containers of fried chopped onion at Costco. A few years ago I worked in a country with little selection, poor quality, and high cost groceries. Ordered fd food by the case and lived on it for more than a year. The Honest Earth instant mashed potatoes are very good. I tried several milks and liked Thrive Instant milk the best. Tried lots of fd eggs. Bleh! None of them tasted good as stand alone scrambled. But were fine mixed in as an ingredient. Ovaeasy was the best of the bunch. Freeze dried peanut butter is not bad; very nice mixed in with West African beef stews. Have not found any decent fd sweet potatoes. Only one that came in chunks still had tough (read inedible) skin attached. Suggestions? Thank you for mentioning the costco and thrive connection, i never even knew they had that stuff online, i am going to look into it as i think i can get it shipped out here for free. So Thank you! You can order some Augason farms products from Walmart online also and most of it at a lower cost than their website. They don’t have a complete line but I get my wheat berry’s from there. Completely agree about the yucky FD sweet potatoes. I’ve been looking and haven’t found any that have been peeled before freeze drying. Share the info if you find them?! After all the basics with complimenting spices….we have added a number of spiritual goodies….popping corn, freeze dried fruits to add to cereals or pancakes or regular cakes, syrups, canned butter as well as freeze dried butter powder, lots of different nuts, specialty oils (coconut, olive, avocado). Our thinking is to make the occasional FUN desert or meal addition to keep the spirits up. The grandkids helped create the list. We DO continue to rotate these items, just to keep them fresh enough but most appear to be keeping quite well. We believe that clean water will be the most scarce thing at our location, so we keep a lot of commercially canned foods for the “open and eat” value. We may need the water and salt content in those cans at some point too. We used to can our own food, but haven’t for years. We still have both water-bath and pressure canners, so we could do it again if needed, especially if the freezer thawed out. Last night, I opened a store-brand “best by Dec 2015” can of sauerkraut that wasn’t good. The can looked in excellent shape but the kraut didn’t smell right, was too “brown-looking”, and tasted like the tin can. That tells me that the protective coating of the can didn’t go 2 years after the BB date for the kraut. I would suspect that other acidic foods could be the same way. I store the glass jars of kraut, so far the 2-3 small glass jars I bought 3 years ago and stored in deep pantry in a box and kept at 60 degrees still is good. I’m the only one who will eat it, so I get the smallest jar I can. I keep checking it, so far so good. My cousin (East Coast) has a neighbor that swaps kraut for part of her crop of cabbage. They are eating stuff put up in 2010 but she has a deep root cellar she keeps her canned goods in. She’s been “prepping” since 2009 but didn’t know it LOL. They have a huge garden and she cans, freezes and dehydrates all they grow. When they came to visit a couple of years ago she said they were eating stuff she put up in 2009 and it was still good. Modern Throwback, Any chance we could have your recipe for homemade cream soups? I really don’t follow any recipe — a roux (for a basic white sauce) is made with proportions. For example, if you want 1 cup of a white sauce, begin with 1 Tablespoon of butter (or a fat), then add 1 Tablespoon of flour. Once you have made the roux (which is the thick ‘paste’), then slowly add in your milk/cream and heat to thicken. To make your own ‘cream soup’, use less milk, unless you are using that ‘cream soup’ as an ingredient in a meal that requires you to reconstitute the can of soup with additional liquid. A roux is the basis for most gravies and sauces. It can also be used as a thickener for stew or a soup. There are loads of how-to videos and step-by-step instructions online — just search ‘roux’ and you’l have more info than you ever needed!! Anybody have a good easy English muffin recipe? Patrice Lewis has one you would have to check her archives. She & her daughters would make a batches of them. I do not recall if the recipe came out of an old cookbook before 1950’s or one they made up themselves. We store canned Red Feather Creamery Butter from New Zealand. Available by the case from Amazon. WAY better tasting than powdered butter and lasts forever. Would be heaven in a SHTF scenario and much needed fat. I also stay away from non-fat or low-fat milk. I store full fat as evidence shows we need the fat, especially in the stressful, high-activity, low calorie world we would be facing. I grow very little summer squash and rhubarb, but have over abundance of it every year. I make sweet pickles of the squash with vinegar and sugar (store lots of vinegar) Serve cold on the lunch table. They last about three years. 12 Qts. strawberry jello rhubarb jam for toast and shortbread tarts. Potatoes sprouting, slice and blanch then dehydrate. I put in my coffee mate canisters with screw on lids and add all the seasonings for scalloped potatoes. Very easy! Dried bread cubes with seasoning for dressing too. I read that pumpkin and winter squash can be canned in cube form only as center of jar too dense for proper temp. How about sharing your receipt for the Strawberry jello rhubarb jam???? ?